Structural Insulated Panels: SIPs are a unique building product because they combine structure and insulation in one large rigid panel – available in many thicknesses and sizes, up to 8’ x 24’. 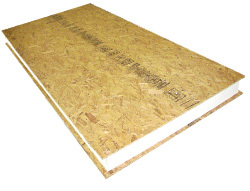 Nail Base Panels: PorterSIPs offers a nail base panel to be used in roofing and siding applications requiring OSB on one side of the panel only. This provides excellent insulation, and a nail base for attachment of roofing and siding. SIPs achieve their structural integrity with an “I” beam effect by using rigid sheets of oriented strand board (OSB) as the flanges of the “I” beam and a rigid plastic foam core as the web of the “I” beam. The key to this structure’s performance is that the EPS core keeps the OSB skins from buckling by keeping them “in plane”. The rigid plastic foam core of (1 pound per sq. ft.) expanded polystyrene (EPS) is the insulation and the web of the “I” beam. The thicker the panel the more load the panel will carry and the greater the insulation value. The EPS foam core and the OSB facings are rigidly bonded together in the factory under strict quality control standards, making building code compliant panels. Factory manufacturing does not stop at the bonding of the OSB to the EPS, it continues on with precision cutting and shaping of the panels to match the specified building design. SIPs have evolved as a hybrid of stick-built construction and use dimensional lumber for corner connections, plates and window/door framing point loads, and sub-fascia. 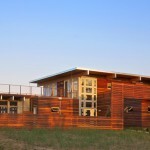 SIPs are sized to work with standard dimensional lumber; 2 x 4, 2 x 6, 2 x 8, 2 x 10 and 2 x 12. Compared with stick framing, construction with SIPs eliminates many steps and time is saved. 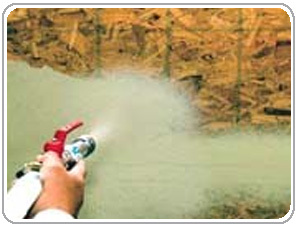 SIPs contain the “framing”, sheathing, and insulation in a product that is assembled in one step. Switching from stick-built to SIP is a relatively easy process that requires only a few changes. Many standard carpentry tools are still used when building with SIPs. However, power lifting equipment is required as a SIP can weigh up to 800 pounds. Also, SIPs use special fasteners and foam recessing equipment if field modifications are required. To aid in learning the process of SIP construction, PorterSIPs offers on-site installation crew training or can provide contacts for expert and cost-effective SIP erection. PorterSIPs Exterior House Wrap is a new product from PorterSIPs. This proprietary exterior grade wrap is a cross-woven polyethylene fabric with a durable plastic coating that makes it virtually tear-proof. It is UV stable for up to 12 months uncovered. 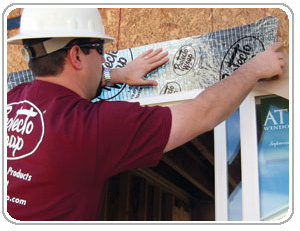 PorterSIPs Exterior House Wrap allow airborne moisture vapor to escape without condensation. More importantly, this product is an excellent drainage plain; it will shed water and protect the exterior skin of the SIP from moisture damage when wind driven rain is forced behind siding and flashing. Ask your sales representative about PorterSIPs Exterior House Wrap for more information. PorterSIPs Premium Polyurethane Construction Adhesive is a new product that PorterSIPs is offering. It is specifically made for sealing PorterSIP connections. 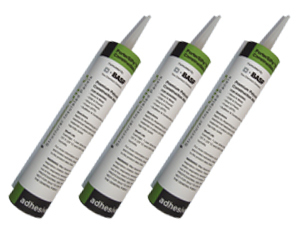 It is a construction adhesive / sealant that provides excellent results and is safe to use. It is also waterproof and usable in all climate conditions. Additionally, it is low in VOCs and meet the LEED requirement for such products. Ask your sales representative about PorterSIPs Premium Polyurethane Construction Adhesive for more information. Sto EmeraldCoat® is a fluid-applied barrier membrane used to protect structural insulated panels from moisture related degradation. Unlike sheet building wraps, StoGuard Emerald Coat is factory-applied directly on the exterior skin of the SIP, providing a durable, continuous weather barrier that won’t rip or tear from the panels on your project. ProtectoWrap Super Stick Building Tape is a high-performance SIP joint flashing tape. It is a high tack, tenacious, durable, peel and stick air/vapor barrier tape system which is used as a full-coverage air vapor barrier membrane. It is designed to be applied in most temperatures, down to -20°F. It utilizes a high tack pressure sensitive adhesive (PSA) combined with a high performance facer film. This design provides a full 12 month UV exposure. A greener, cleaner building tape solution that offers No VOC’s, HFCC’s, nor CFC’s. It is non-toxic and non-allergenic. No Off-gassing is produced during the manufacture nor installation of this product.